IberGour is a Spanish company with offices in Barcelona. It was created to offer customers the opportunity to purchase the best Iberico ham produced in Spain, online, at the click of a button. With this goal in mind, our efforts are focused on two objectives: selecting the very best Iberian pork products, and making sure that our customers enjoy their shopping experience with us. Spanish hams with superior organoleptic characteristics are artisanally prepared by small producers in limited quantities. Veterinarians and other specialists advise IberGour in selecting products that not only comply with stringent health requirements, but offer the finest in quality from the standpoint of flavour, aroma, texture and appearance. From the time you enter our website until the ham is delivered to your door, we want to make your shopping experience simple, quick and convenient. Doing this requires teamwork, and our team includes e-commerce specialists, warehouse staff, technicians and customer service personnel. We work closely with our transport staff, with up-to-the minute status information enabling us to track shipments from the time they leave our warehouse until they reach their destination. 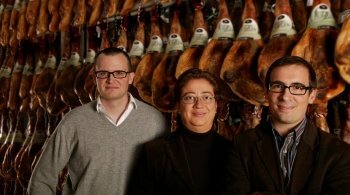 Jose María Sánchez de Ocaña, Núria Autet, and Miquel Nieto, founders of IberGour.